Pinar del Rio hotels, Pinar del Rio villas in Pinar del Rio, Cuba - rent Pinar del Rio hotels, Pinar del Rio villas in a hotel by owner in Pinar del Rio, Cuba. The hotel Cayo Levisa is located in an idyllic location in the North Coast of Pinar del Río, at only 2 hours from La Havana, in Cuba. The property is surrounded by thousand of cays and islands where sand and greenness blend together with crystal clear waters, a truly natural paradise whose surroundings have remained virgin, with an unforgettable blue and calm beaches, the ideal location for scuba diving and water sports. The beautiful hotel La Ermita is located in the Western part of Cuba, in the city of Pinar del Río, renowned for its breathtaking natural sites and tobacco plantations. This cozy property was built in complete harmony with the Vinales Valley landscape, of which it offers an amazing panoramic view. The hotel is ideal for nature lovers since the surrounding area offers a good choice of trekking and walking paths through the nature. It is on a height that looks upon one of the most beautiful views in the Vinales Valley. It is distinguished by the exuberant vegetation that surrounds it. Is an exquisite architectural masterpiece that was designed to ensure that guests fully enjoy this unparalleled natural landscape. Pinar del Río is a city in Cuba. 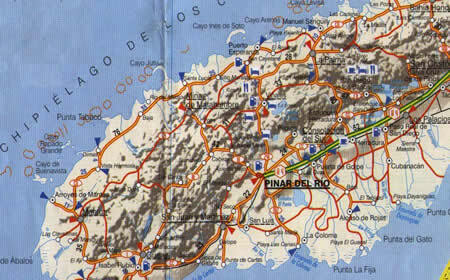 It is the capital of Pinar del Río Province. It is located in a major tobacco-growing area and is a centre of the cigar industry. Inhabitants of the area are called Pinarenos.